Forest defenders were protesting the clearcutting of old growth Redwood forests, as well as the negotiations to save some of the trees between California Senator Dianne Feinstein and Texas businessman Charles Hurwitz, whose Pacific Lumber Company owned the Headwaters Forest Complex in Humboldt County. Feinstein's proposal would only save 7,500 acres of the old growth forest. Earth First! and others were demanding that all 60,000 acres of redwood groves in the area be preserved. 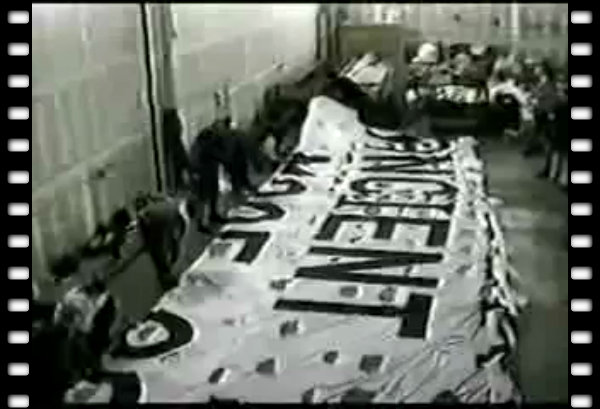 The largest banner hung on the Golden Gate Bridge weighed 100lbs and measured 70' x 35'. It read: "Hurwitz, aren't redwoods more precious than gold?" Maxxam Inc/PALCO CEO Charles Hurwitz once stated, "He who has the gold, makes the rules." Despite multiple protests and tree sits, Maxxam changed generations-old policies of sustained-yield logging at Pacific Lumber Company with clearcutting. Eventually, the agreement between Hurwitz and the U.S. government, with California participation, created the Headwaters Reserve Forest, protecting 7,500 acres, much of which had already been clear cut, while limiting the types of logging that could be done on the remaining 200,000 acres. It is the only forest reserve in the United States. "I shamelessly and proudly call myself a tree hugger," Harrelson said via cellular phone before he descended from his perch about 200 feet above the bridge traffic. CHP closed the bridge for much of the day and nine forest defenders were arrested. SF District Attorney Terence Hallinan decided not to charge the protesters with the more serious charge of impeding police in their duties. But State Senator Quentin Kopp said the violations should be felonies.